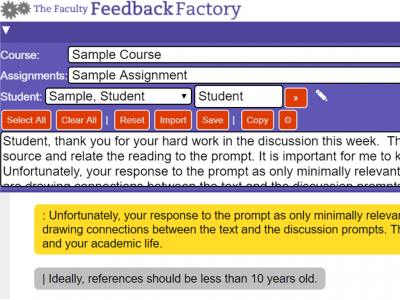 Faculty Feedback Factory allows online professors to easily create snippet banks, turn them on and off, rearrange them, and quickly generate blocks of high-quality, personalized, and specific narrative feedback for students. As online universities face scrutiny from accreditors and regulators regarding a lack of substantial feedback and interaction between students and instructors, an online professor has developed a solution to save instructors time grading assignments while protecting quality compliance. Dr. Joshua Reichard, developer of the Faculty Feedback Factory software to help online professors generate high-quality, specific feedback for student assignments, argues that “automation and authenticity in online grading are not mutually exclusive”. Faculty Feedback Factory allows online professors to easily and quickly create snippet banks for specific courses and assignments (based on their rubrics or other scoring criteria), turn them on and off, arrange and rearrange them, and quickly generate blocks of narrative feedback for student assignments. Professors can sign-up for a free account here. A free 3-month premium subscription is available with coupon code “FREE”. The free version includes one course and one assignment and a premium upgrade is just $9.99 USD/year. “I developed Faculty Feedback Factory to automate my own repetitive grading tasks”, Reichard said, “and in turn, I’ve saved myself a calculable 6,000 hours in the past 4-5 years”. Along with two other ed-tech entrepreneurs, Reichard founded Feedback Software, LLC, a startup in the world’s top-ranked university affiliated tech business incubator. Together they launched Faculty Feedback Factory to aid other online professors with grading seemingly insurmountable queues of student assignments. The software is easy to use and works with any LMS; generated feedback is simply copied and pasted using the clipboard. More than 76% of online professors in US Higher Education are now contingent, contract workers. “It is clear that online universities are increasingly scrutinized by accreditors who want to see that professors are reading student assignments and providing substantial feedback, but class sizes of 30+ students makes it challenging for over-worked and under-paid online faculty, especially adjuncts, to give students the level of quality they deserve”, noted Reichard. “However, with Faculty Feedback Factory, I’m defending the integrity of authentic, professor authored, student-specific feedback, while automating repetitive tasks. Faculty Feedback Factory balances authenticity and automation; I have improved the speed, accuracy, depth, and breadth of feedback”, Reichard reported. 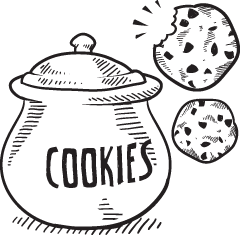 The software is entirely cloud-based, runs in a web browser, and is mobile-ready. Reichard and co-founders Elijah Stambaugh (founder of the Lightning Grader automation software) and David Richardson (an educational technology specialist) launched the Faculty Feedback Factory to make a positive difference in the lives of online professors and the students they serve. “Our hope is that we can improve the quality and integrity of the teaching and learning process for faculty and students alike”, Reichard said. For more information, visit our website.